EEG machines sometimes use parallel cables to send event markers. These are useful to figure out when certain situations occur, e.g. when a stimulus is shown. When were doing building our EEG experiment, we needed to know how to interface between Python and the EEG hardware. Image from Wikipedia. The female end of a parallel port. Image from http://d4web.net. Note the 8 data pinouts (D0 - D7). But what was that actually doing? To the other end of the cable (the one that we spliced), we connected a multimeter. Turns out, when 'x' was set to '1', there was voltage across D0 and ground. When x was set to '2', D1 was active. But when x was set to 3, D0 and D1 were active, but D2 was not! And that worked! And the numbers matched the EEG markers! Sure, this seemed like an unnecessary exercise to splice the cable, given that we could have just read the to read about what the function does. 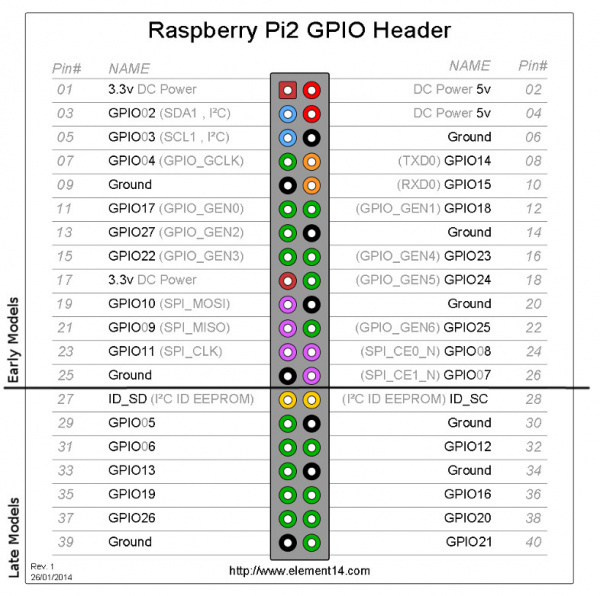 But a bit of hands-on knowledge is a good thing, and the concept here is practically the same for using GPIO found on things like the Raspberry Pi. Maybe it's possible to run an EEG study/ interface with the machine from a single Raspberry Pi? (assuming it is good enough to display stimuli correctly). Maybe patch the GPIO back to a parallel cable?